M. Fox, T. Gilroy, J. Doherty, W. Kirkpatric, J. White, J. Sheridan, P. Geraghty and ? Geraghty at Sawill. Date unknown. Courtesy of David Gilroy. Possibly Connaght St, Athboy. Date unknown. Newman’s Mill, June 2000. Courtesy of David Gilroy. The Market House, Athboy. Courtesy of Bernard Walsh. Athboy Railway Station. Courtney of Bernard Walsh. Athboy Railway Station, 1939. Courtesy of Bernard Walsh. Ollie Bird’s Grocers. Courtesy of Anne-Bird Leavy. Now the site of McElhinneys. Courtesy of Des White. Site for new Bank of Ireland (close up) Courtesy of Des White. 1925 announcement that the RIC Barracks would become the site of Athboy’s Bank of Ireland branch. Courtesy of Des White. 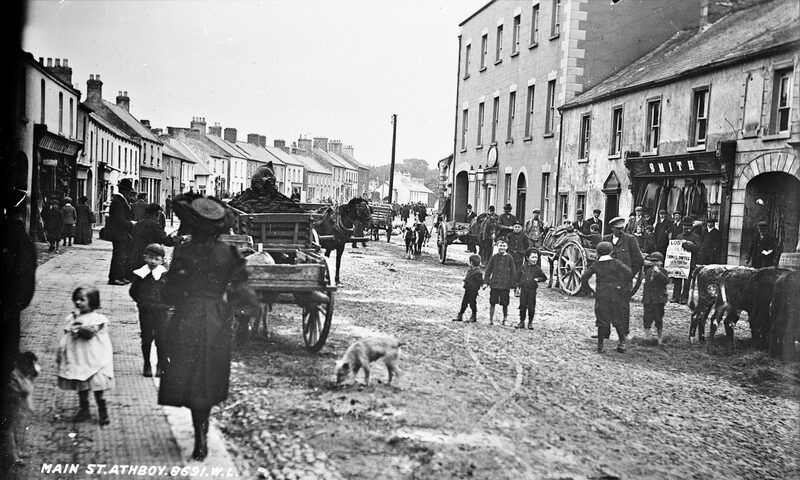 Main Street of Athboy, date unknown. Courtney of Des White. This is the gate lodge and entrance to Frankville House located on the Kildalkey Road. This gate and lodge were demolished to make a new entrance and school extension to the Convent of Mercy secondary school on this site. Photo of Dan Reilly’s shop at the corner of Lr Bridge Street and the Trim Road. Centre is Dan Reilly with his wife holding daughter Beda. The boy with the bicycle is Michael Brogan. The flags and bunting are for the Eucharistic Congress of 1932. This aerial view of Athboy is dated April 1953.